The Bed Bug Defender™ is a device that allows you to monitor bed bug activity. The Bed Bug Defender™ design catches bed bugs while climbing up or leaving your bed. There are two primary wells in this product. There is a center well; to catch bed bugs coming from the bed out to the baseboards. There is also an outer well; to catch bed bugs coming to the bed to feed. The bed bugs cannot crawl up the inside as the surface it too slippery for them. Bed Bug Defender™ can be used in homes and offices under the legs of bed frames, chairs, tables, and other furniture. 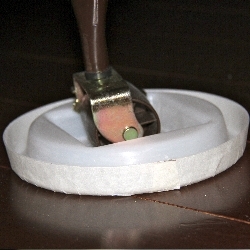 Its unique design supports furniture of both square and rounded legs. The Bed Bug Defender™ monitors should be placed under each leg of the furniture or bed. The leg of the bed or furniture should rest in the center well of the Defender. Do not let any items hang off of the bed such as blankets, sheets, clothes or furniture and do not allow any items to touch the floor at any point during the day or night. Move the bed and furniture away from the wall so bed bugs cannot climb or gain access. The Bed Bug Defender™ should remain in place for a minimum of 30 to 60 days to assist in monitoring for bed bugs; however it is recommended that you keep it indefinitely for continuous bed bug monitoring.